Due to increasing performance requirements for electronic components, enourmous demands for thermal management at ever smaller scales are placed. 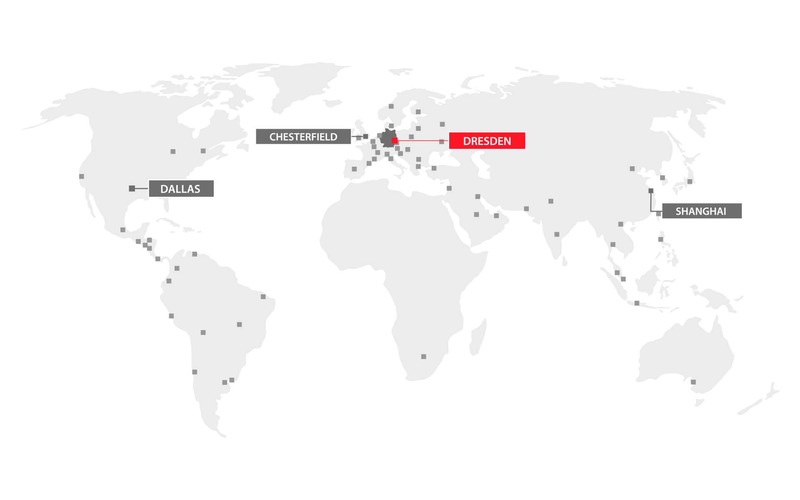 The Frauenhofer Institute for Silicon Technology (ISIT), as development partner, supports companies in meeting these growing needs in an optimal fashion. The ISIT has to detect the smallest possible temperature differences when analysing electronic components. 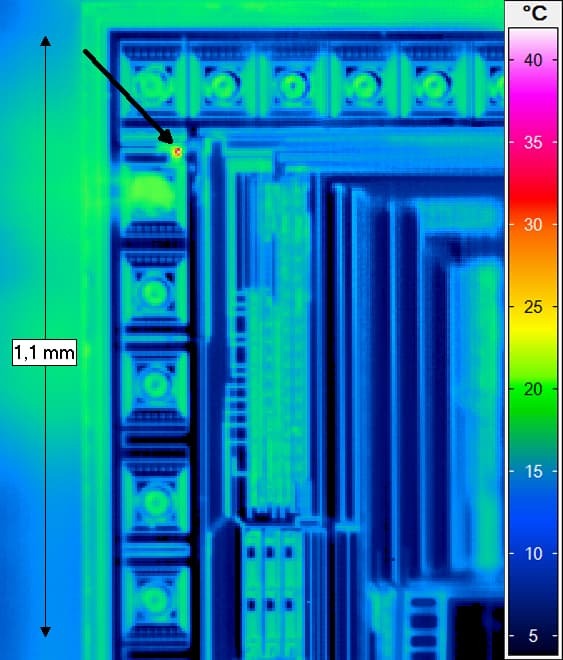 With InfraTec’s high-end camera series ImageIR® temperature differences of 15 mK can precisely be measured and securely identify even newly emerging thermal issues. Thus, development failures can be avoided at an early stage. The cameras are available with different detector formats of up to (1,024 × 1,280) IR pixels. Using a 15 µm pitch together with different, high performance microscope lenses, a geometric resolution of only 2 µm can be achieved. Another benefit for the ISIT derives from the precision calibration of the ImageIR®. The use of a set of additional side calibration curves compensates for drift and ensures a maximum measurement accuracy even under fluctuating measurement conditions. As with all thermographic testings of electronic components and circuits, measurements are influenced by the differing emissivity of the individual components. To overcome this situation, InfraTec offers an automated pixel-wise emissivity correction routine directly in its control and analysis software IRBIS® 3. Using these tools precise statements can be made about temperature distributions and developments over time. The goal towards high efficiency is of great interest, because it has a direct impact on the achievable energy output of wind turbines and thus, on the profit of the operator. Of course, the rotor blades of modern wind turbines have an already optimised efficiency resulting from decades of aerodynamic research - their profiles are designed with super computers and optimised in wind tunnels. In their production new technologies are applied, which were first designed for the construction of high performance aircrafts. The goal of these measures is to have maximum percentage as well as maximum controlling of laminar flow between the rotor surface and the surrounding air. However, turbulent flows reduce the efficiency and therefore must be reduced to what is absolutely necessary. In addition, there are many more factors that negatively affect the efficiency of wind power stations. It starts with alignment of the blades, leading edge contamination, erosion and damages to defective flow control add-ons, such as leading edge protection, vortex generators and zig-zag tape sections. For several years now, Thermography has been a valuable tool for investigating the boundary layer behavior on airfoils in order to aerodynamically optimise it. It makes use of the fact that the heat transfer resistance of the boundary layer is significantly lower in turbulent flow than in laminar flow. For example, if the surrounding air is colder than the rotor blade surface, a thermal pattern appears on the surface which indicates the state of the flow. Because the temperature on the turbulent flow region is colder than on the laminar low region, measuring this thermal pattern with a thermal imaging camera permits detecting the boundary layer condition in real-time. 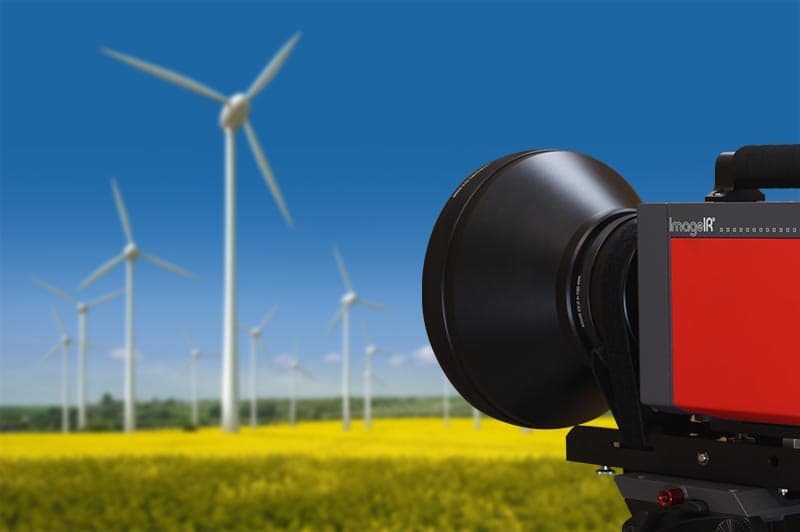 Highly thermally sensitive high-speed infrared cameras with high performance telephoto lenses are used to visualise the boundary layer condition of rotor blades in operation, in which the rotor blades and the measurement position are several hundred meters apart. These measurements deliver qualitative information regarding the transition location along the rotor blades, and allow comparisons between different operational states and conditions. A high-speed actively cooled (640 × 512) IR pixels InSb-focal-plane array photon detector with a thermal resolution better than 20 mK is used together with a telephoto lens of 200 mm to acquire high resolution thermal images of rotor blades in operation. Due to extremely short integration times, only minor motion blurs occur during tip speeds of 75m/s. C. Dollinger, N. Balaresque, M. Sorg: Thermographic Boundary Layer Visualisation of Wind Turbine Rotorblades in Operation.